Black & White & Dead All Over by John Darnton, a Mysterious Review. 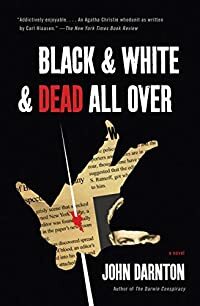 Review: John Darnton provides an insider's view of the world of newspaper publishing, with a little murder on the side, in the entertaining Black & White & Dead All Over. The "dead" is Theodore S. Ratnoff, The New York Globe's editor in charge of style, standards, and usage--the "coin of the realm", as it were--and famous for dressing-downs to subordinates, especially copy editors, who "labored in suffering obscurity like half-blind medieval monks churning out illuminated manuscripts." Someone apparently took exception to one of his verbal lashings of the whip for a dangling modifier or figurative stabs with red-hot poker for a pejorative anonymous quote to thrust an editor's spike, once used before computers to literally kill a story, into the senior editor. Investigative reporter Jude Hurley is assigned the story. "Don't worry," he tells his boss, metro editor Bernie Grabble, "If I solve the murder, you'll be the second to know … right after the murderer, of course. We'll need comment from him." Black & White & Dead All Over can be read as a murder mystery, but (as illustrated by some of the quotes provided above) it's almost more entertaining as color commentary on the state of the newspaper publishing business today, replete with characters who are thinly disguised versions of their real-life counterparts. The murder investigation itself is crafted really well, with plenty of suspects and motives and red herrings. The attention to detail is remarkable, stemming from the author's considerable knowledge of the industry, and adds to the authenticity of the story. And though the plot frequently teeters on the edge of being overly complicated, in the end it comes down to Jude Hurley being the good reporter he is, realizing the facts behind the murder of Ratnoff, and later two others, are much simpler than the elaborate stories being put forth by those around him. Acknowledgment: Random House provided a trade paperback edition of Black & White & Dead All Over for this review.